The Stereophonics have always been a band who have got it spot on or totally wide of the mark. Remember when they sent out the semi-coded warning to journalists on "Mr Writer" to tell the people like it is - we were , The Stereophonics had turned into one of the most boring predictable excuses for a band the world had ever seen...it seems that they've sent another missive out to the world with the pre-requisite that "You Gotta Go There To Come Back". So finally we get an admission of guilt from Kelly Jones and co that "J.E.E.P" was infact a tuneless dirge and that their fourth album sees the band back on track delivering the tunes we always knew were in them once Kelly had got over his acoustic troubadour phase. "Help Me (She's Out Of Her Mind)" isn't so much a tune, but a statement that the Phonics are ready to rock once more and they still manage to throw in a little Stevie Wonder in the midst of this post apocalyptic breakdown. "Maybe Tomorrow" is the best song the band have written since "Traffic" and a real showcase of how far the band have progressed over the four albums. While the basics of the songwriting itself is not that far removed from the early days, it would have been hard to imagine the band backed up by soul singers and keyboards around the release of "Word Gets Around". Similarly the trip-hop beat of the title track "I'm Alright (You Gotta Go There To Come Back)" brings to mind Massive Attack and while it's hard to imagine Jones sitting at home listening for inspirational beats when you consider his collaboration with dance act Manchild a few years ago it shows there is more than meets the eye when considering exactly what influences make up the Stereophonics sound. "You Stole My Money Honey" is the sort of song which you can imagine singing in a small public house in the valleys and the low-key almost lo-fi production on this track by Kelly Jones shows that the band are taking much more time to appreciate the feel and flow of a song rather than over-producing and ironing out the individual personality of a song. After the success of their cover of Rod Stewart's "Handbags And The Gladrags" it was inevitable it would have some subliminal influence and on "Climbing The Wall" the Stereophonics offer their first original loungecore track complete with Jones crooning "what makes men lie through their teeth" before the horns swell. There are very few rock bands who can implement the use of strings without being terribly overblown and this is probably the best example of where a little restraint and understatement has benefited a track which in the wrong hands would have fallen at the first hurdle. "Nothing Precious At All" and "Rainbows And Pots Of Gold" are the sort of songs written specifically for the soundtrack of cinematic sequences, the former for a darkly romantic comedy and the latter for a James Bond film that was never written. 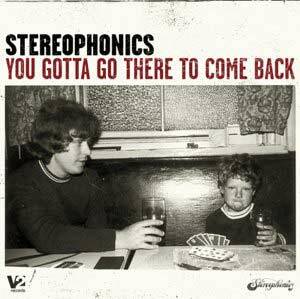 "You Gotta Go There To Come Back" is an album which sees us fall back in love with the Phonics. With the exception of the more rockier moments, "Getaway", "Jealousy" and "High As The Ceiling" where they've clearly been listening to too much Black Crowes, the band have recorded songs that can compete with their back catalogue and make us feel they're still relevant rather than a nostalgic kickback to our yesterdays. Mr Jones - were telling it like it is and it's good to have you back!! !